I had been riding on the Cross Country train for nearly two hours when the countryside began to take on a more familiar guise. It had been four months since I had seen the landscape of County Durham and yet those four months seemed like another lifetime. They were. My brain has a rather unsettling capacity to compartmentalise based on my circumstances. When I was home in the US, my life in England had felt like a very distant dream. It felt like it had never really happened. I had only manufactured the medieval cathedral city with its charming cobbles and friendly Northerners with at time incomprehensible accents. Now that I was fifteen minutes away from those streets, my life in the US is what felt like a dream. I scanned the blurred scenery passing quickly outside of the window much like my racing thoughts. I was anxious to see the Cathedral. Reader, you simply must take the train when you go to Durham. It is by far the most fantastic view when all of a sudden that striking edifice appears almost out of nowhere, as if my magic. As if it really were Hogwarts, hidden from Muggle eyes, but becoming inexplicably visible to us magic-folk. I couldn’t contain my smile. The feeling of warmth, of home, flooded my senses. It was still there. Of course it was. Did I actually believe something would have happened over the past four months to change that? It had stood for a thousand years and it would likely still be there a thousand years after my congregation ceremony the next morning. I stood up and gathered my suitcase and went to the vestibule. I texted Sam one more time to make sure she was on her way. It had been so kind of her to offer me a place to stay while I was in town. The hotels had miraculously raised their rates almost as if they had anticipated that hundreds of graduands and their families would be seeking a place to stay this week. The train slowed and I stepped out onto that platform that had carried me away to so many places over the past year and a half. I began thinking about the hiking trip we had taken along Hadrian’s Wall, the trips down to London, my birthday in Newcastle before we all really knew one another. As I headed to the front of the station I saw Sam’s jeep pulling up to the roundabout. It was too surreal. How many times had we done this on our way to CrossFit? I laughed when I saw her mentioning the irony that she was still picking me up and carting me around. We picked up right where we had left off. Somehow it was perfect. Sam had been the last person I had said goodbye to when I left Durham. She was the first person to see me again now I was back. We first headed to the robe makers. I wanted to pick them up and pay for them so that I wouldn’t have to worry about it the next morning. We spent a good twenty minutes driving around trying to find it. 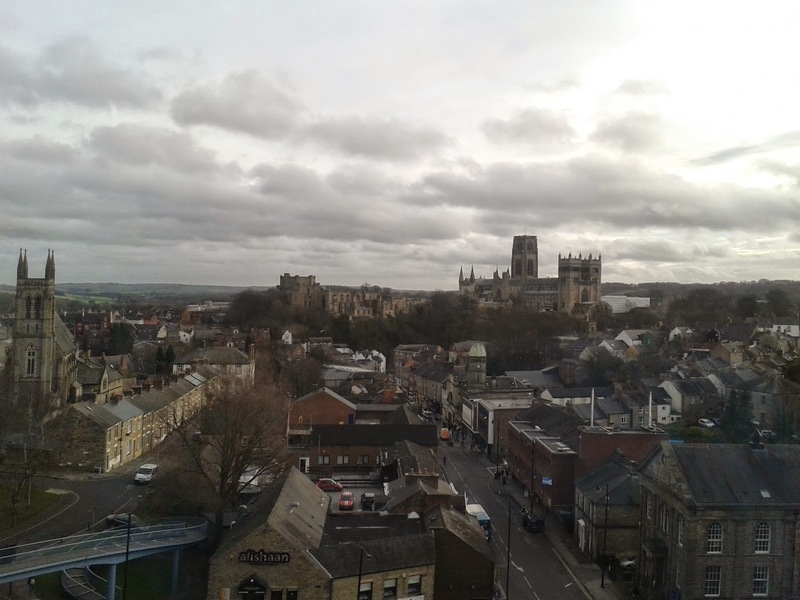 It was a good way to see Durham again. Finally, we found the narrow street and Sam dropped me off so I could run in. I was greeted by a friendly, middle-aged woman who, upon hearing the door, looked up anxiously. “Oh, hello there,” she said. The Northern accent washed over me. I was so glad to hear it again. I explained I was there to pick up my robes and her face fell. I smiled and assured her it would be fine. I paid for them and then I did just try them on, wrong hood be damned. I looked in the mirror and smiled. Every moment of my year in Durham seemed to converge. Every moment had been necessary to get me to this point where I was standing in a tiny robe maker’s shop, staring at a mirror, clad in black Harry Potter-like robes with a shiny, incorrect hood. It was perfect. I smiled at the shopkeeper and thanked her. I would be seeing her the next morning to pick up the correct robes. I found Sam at the top of the road and we drove off to her flat. I dropped off my things and packed my backpack with CrossFit clothes. We planned to meet at her daughters’ schools and go to the 5:30 class at Jacana. I was starved for exercise and I couldn’t wait to see everyone again. 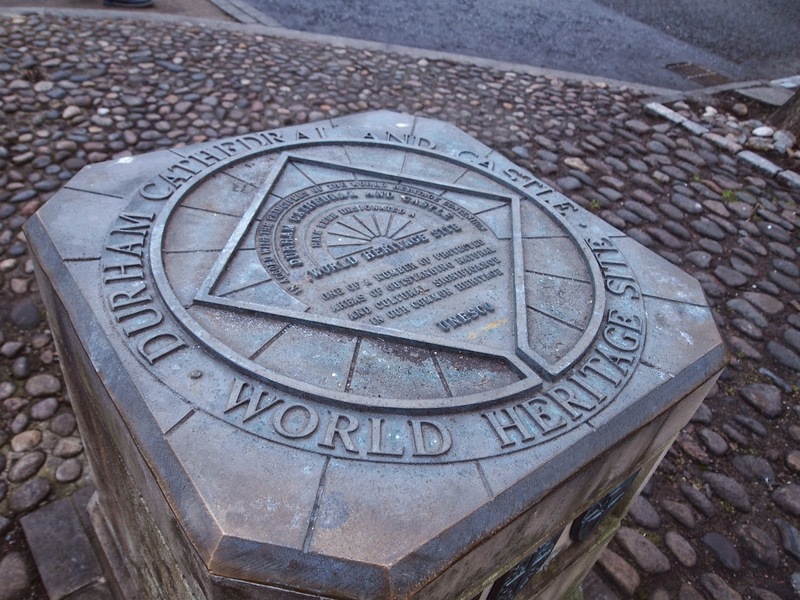 Until then, I planned to walk about town and hopefully meet with Mizah who had just arrived in Durham herself. Sam dropped me off near town centre and I headed toward Market Square where Mizah had said she would be. As I walked the familiar streets it felt very much like the whole of the city had been put on pause while I was away. No. It felt like I hadn’t been away at all. Like I had gone to bed the night before in my study bedroom and had wakened four months later, a sort of Rip Van Winkle effect. A shop here or there was changed, but everything else was perfectly normal. I rounded the corner and entered Market Square. Across the way I saw the familiar form of my flatmate. Seeing Mizah across Market Square felt the most natural thing. Of course she was there. This is where she lives. Except, she doesn’t. Not anymore. And for that matter, nor do I. We hugged and instantly began chatting about anything and everything. Her parents were in the market so we headed inside to meet them. Her mother I remembered very well from her visit to Durham while we were still students. Now I also got to meet her dad. Together we headed toward the Cathedral. “It’s like we never left,” I said to Mizah. “I know I feel the same way,” she said. We emerged onto Palace Green it was already prepared for the next day’s events. We paused for a few photo opportunities and then headed across to the Cathedral entrance. It had scaffolding around it and both Mizah and I hoped it would be gone by the next morning. 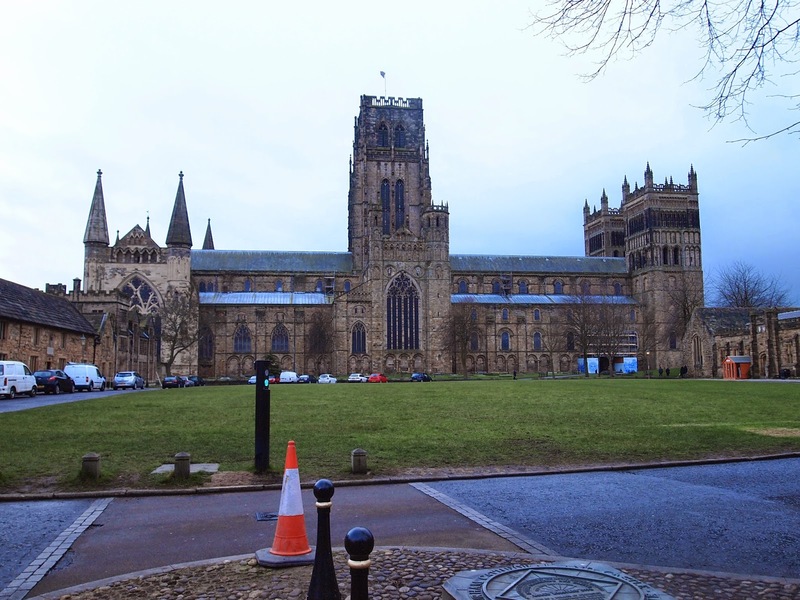 Not by best photo of the Cathedral but you do get to see an English traffic cone. BONUS! Never saw this marker the entire time I was in Durham. I even worked up at Palace Green and walked by it every day. The Cathedral was bathed in purple light. Monitors were placed every few rows to afford everyone a good view of the proceedings. Chairs were placed along the side aisles and in both transepts. It was a grand setting. We slowly wound our way around, taking everything in and trying to drink up as much of our surroundings as we could. Knowing too well our time was limited. We headed out to the cloisters and were disappointed to see more evidence of construction. It seemed like they had chosen that time to do some remediation (a necessary thing to be sure, though it wasn’t very attractive). 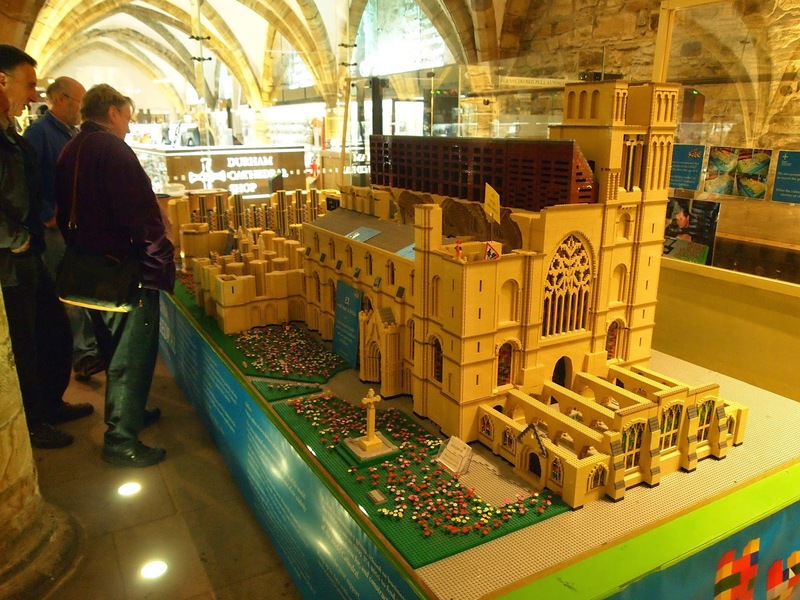 We stopped by the lego cathedral in the shop area to check on its progress. We were delighted to see just how far it had come. It seemed nearly done. The light was fading and I had to be off to meet Sam again. I hugged Mizah and the feeling of finality struck me severely. When we had said goodbye four months ago we had been able to reassure ourselves that we would see one another soon. Now, I wasn’t sure when I would next get to see her. Now this was far too surreal. Alex was waiting to cross the road like I had seen him do a dozen times when our paths would cross in Durham as students. We smiled and laughed from across the road and waited for the traffic to stop so we could finally actually say hi. I ran up and gave him a huge hug. I had missed Alex tremendously and seeing him again was wonderful. We laughed at the absurdity of meeting the way we did and then began talking about the past four months. About being out of touch with everyone, about careers and PhDs, about the ceremony and the department, about Robin and the full moon. I couldn’t shake the feeling that if I walked down to Howlands, I would magically find my room key in my pocket, I’d walk into the old flat and see Mizah in the kitchen and maybe run into Erin on the way to my room. It all felt too normal and the past four months felt even more dream-like. Afterward, we headed back to Sam’s and settled in for a nice, relaxed evening. Sam I stayed up to nearly midnight catching up. I went to sleep that night feeling much more at ease than I had since I had gotten back to the UK.